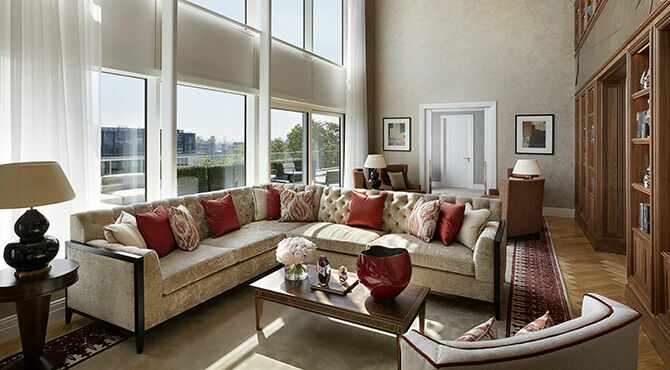 Four Seasons Residences London at Ten Trinity Square is taking the ‘home away from home’ aparthotel concept to the next level.Ten Trinity Square is the new best kept secret for the discerning business traveller. A city base that's more than a home and more than a hotel. Now top executives, celebrities and international deal brokers can base themselves just 20 minutes from the West End and the East End – as convenient for Docklands as for Mayfair. Whether you are in London to capitalise on exchange rates, float on the Stock Exchange, play the property market, negotiate a merger or acquisition or to finalise Brexit plans, this could be your perfect home base. During a historic summer, which saw the royal wedding of HRH Prince Harry to Megan Markle, guests staying in the two David LINLEY interior designed Residences were able to enjoy their own royal connection. The renowned interior designer David Linley is the son of Princess Margaret and the 1st Earl of Snowdon, the acclaimed photographer who recorded the royal family throughout modern history. The Residences are in sight of the historic Tower of London – home to the crown jewels.Ten exclusive residences offer luxurious living in the heart of The City with all the benefits of a hotel. World class design and architecture is superbly combined in the restored Grade II listed building which was once the former Port of London Authority Headquarters, situated opposite The Tower of London and the river Thames. 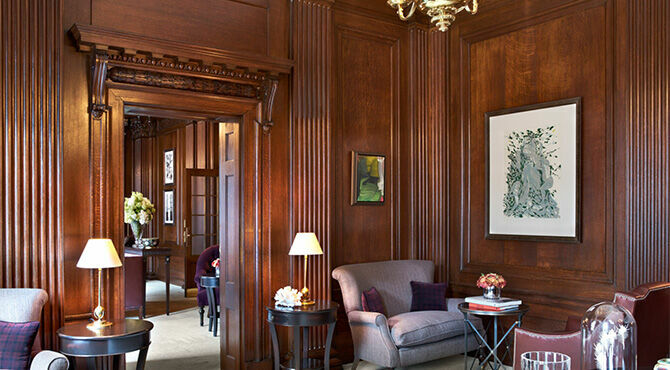 The Four Seasons brand provides a unique standard of quality designed for discerning international guests who expect the best. LINLEY wanted to create a glamorous yet relaxing environment with beautiful fabrics and exquisite accessories. The art and accessories are specifically chosen to reflect the city of London and the continuous movement of trade along the river in times gone by. Carefully selected pieces from many different countries and cultures hint at a time in the 19th century when London became the beating heart of world trade with tea and ceramics arriving from China, silks from Arabia and coffee and spices from the East Indies. It is not hard to imagine the artefacts from all around the globe that would have found their way to the Port Authority after its opening in 1922 and the stories behind them that are invested in the building’s history and heritage and inspired the design and restoration. As a resident of Ten Trinity Square you can make use of the Private Club: perfect for a private meeting to conclude negotiations or sign a deal. Take advantage of an unhurried easy atmosphere with enough grandeur to deliver gravitas without stuffiness.The members-only venue comprises a series of warm, wood-panelled social spaces, including private dining rooms, a members’ bar, the Château Latour Discovery Room and a cigar sampling lounge. Château Latour is for the first time lending its name away from the vineyards to Ten Trinity Square Private Club. Since the inception of the 1855 Bordeaux Classification, Château Latour has been recognised as being a first growth, Premier Grand Cru Classé and 10 Trinity Square are pleased to have created a partnership with Château Latour. Frédéric Engerer, President of Château Latour, says “We are bringing our expertise to designing an ambitious and prestigious wine list, making available some of our most precious stock of old vintages in this unique environment, using our name for the first time, and introducing these bottles to our residence guests and club members.” Make an impression and toast your success somewhere special without being ostentatious. Offer your guests fine dining where East meets West.A discrete, dedicated entrance for guests of the Residences means you can slip in and out as you please. Make your way to your own front door and feel at home right away to unwind after a busy day. Fix yourself a drink, kick off your shoes, relax and enjoy the designer surroundings.If the mood takes you, as a guest you will enjoy full access to the Hotel’s exceptional services and facilities. There are three dining options, including Michelin-starred La Dame de Pic London, the Asian restaurant Mei Ume and the Rotunda Bar and Lounge, plus 24-hour In-Room Dining. Alternatively, a chef will cook for you in your apartment. Ten Trinity Square is redefining life in the city; offering its exclusive guests a tasteful, chic, modern approach to business and lifestyle. It will attract international business users who expect the highest service but want to take ownership of their environment, how they spend their time and how they experience every valuable moment in a new place.It’s all about the experience of living in the fast-paced City of London in a unique Residence with breathtaking views. Enjoy outside living on your own terrace, with a taste of an English garden as you watch the changing seasons on your very own extensive balcony. In today’s fast-paced international commercial world, a lot of business is done out of the boardroom. That’s why access to The Club is so important if you need it.Ten Trinity Square Private Club is a place of purpose where outstanding individuals will meet in a relaxed setting over good food and wine. The Founder’s vision is based on a belief that cultural exchange is the key to fostering relations internationally, and The Club will provide a sanctuary for the sharing of ideas, perspective and aspirations.The Club will facilitate the ﬂow of understanding and discussion at the highest level from all nations and cultures, as a place of enjoyment and relaxation.“London’s great clubs once played a vital role in shaping debate and facilitating exchange – Ten Trinity Square Private Club wIll revive this proud tradition for a new, globalised era”. Equally the spa can be just as important to relax with friends and colleagues. Enhancing the residential experience are a luxurious spa with state-of-the-art fitness centre and indoor pool, Gielly Green Hair Salon, elegant event spaces that accommodate up to 200, as well as 24-hour concierge services.There is choice of interior design apartments to reflect all tastes – from female executives to professional couples and families who will appreciate the option to invite friends or colleagues round for a meal whether they opt to cook themselves or use the services of the in-house chef. It is a busy time of the year for relocating families – schools have broken up for the summer and now is the time that assignees are likely to take up a relocation move or international assignment ahead of the new academic year. Ten Trinity Square offers the perfect transition for relocating to London. Parents will utter a sigh of relief over the spacious dimensions of a real home at Ten Trinity Square. One of the LINLEY apartments even has stairs, the convenience of a proper entrance hall and tucked away corners for private conversations or business calls to enable the family, children and their friends, nannies and relatives get on with life whilst you get on with business. Ideal too as a temporary home in London when choosing new schools, selecting universities or preparing for a new job role, as you feel your way, sense and experience London at its best.Every day you can mix business with pleasure – whatever a busy agenda throws at you there is always a place you can call home at Ten Trinity Square. However the day unfolds there is a Spa, a gym and an exquisite cuisine to remind you of home or where you want to travel to in the future.Golf, cricket, tennis, polo, racing, rowing, martial arts or yoga … it’s all there to experience and can be arranged for guests whether you are at the top of your game or an enthusiastic spectator. And the gym will test even the most honed professional.